JGA is pleased to share with you news about the latest study on trends in high net worth philanthropy from U.S. Trust and the Indiana University Lilly Family School of Philanthropy. Please join our webinar on November 8, 2008, as we discuss the report in detail with Dr. Una Osili, the report's author at the Lilly Family School of Philanthropy, and William Jarvis, with U.S. Trust, Bank of America's Private Wealth Management. The 2018 U.S. Trust Study of High Net Worth Philanthropy, published today by U.S. Trust in partnership with the Indiana University Lilly Family School of Philanthropy, finds that wealthy Americans continue to be generous with their time and money, increasing the amount they gave on average to charitable causes and organizations in 2017, including giving in the wake of natural disasters. The biennial study shows that 90 percent of high net worth (HNW) households gave to charity last year, and 48 percent volunteered time to nonprofit organizations and causes. “It’s important to note that wealthy donors include people from diverse backgrounds and giving traditions. While the impact and contribution of women, racial and ethnic groups, and the LGBTQ community are gaining greater recognition and importance, these groups have long been an important part of philanthropy and the nonprofit community,” said Una Osili, Ph.D., professor of economics and philanthropic studies and associate dean for research and international programs at the Indiana University Lilly Family School of Philanthropy. 1. 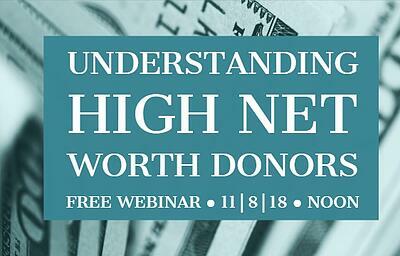 Charitable giving remains important to HNW households. In 2017, average giving amounts rose by 15 percent to $29,269 compared to two years ago, while the percentage of households who give remained high at 90 percent. One quarter of HNW donors gave to disaster relief efforts, motivated by media coverage of the devastation and lack of confidence in government relief efforts. 2. Women are at the forefront of philanthropic engagement and impact. Ninety-three percent of HNW women reported giving to charity; 56 percent volunteer; 6 percent participate in impact investing; and 23 percent serve on the board of a nonprofit organization. One-quarter of HNW women donors support causes or organizations aimed at benefitting women and girls, and said that their number one motivation for this giving is their belief that it is the most efficient way to solve societal problems. 3. Giving is being shaped by a diverse universe of donors. Millennials are less likely to give (84 percent) than older generations (90 percent), yet they are more likely to participate in impact investing (16 percent). Among Hispanic respondents, the volunteering rate was 60 percent, the highest level found among any demographic. 4. Impact matters. When asked to rank seven types of philanthropic activity which have the potential to have the greatest impact, charitable giving and volunteering were ranked as first and second on the list. Despite a strong belief that their charitable giving can have a great impact, 54 percent of HNW donors do not know if their giving has the impact they intended, pointing to an opportunity for nonprofit organizations to communicate the effect of their donors’ generosity more fully. 5. Those with a higher degree of knowledge about charitable giving are more likely to have a giving strategy. HNW donors who rate themselves expert (4 percent) or knowledgeable (52 percent) about charitable giving are far more likely to have a giving strategy than those who rate themselves as novices. 6. Donors have high expectations of the organizations they support. Wealthy donors desire that the organizations they support demonstrate sound business and operational practices, spend only a reasonable amount on general administrative and fundraising expenses, and honor and protect their privacy. 7. A majority of wealthy donors plan to maintain giving levels, despite recent tax law changes. The majority of wealthy donors said that they expect to maintain (84 percent) or increase (4 percent) the amount they give to charity in 2018 under the new federal tax law. Just 17 percent of wealthy donors said they are always motivated to give due to tax benefits. An additional 51 percent said that tax benefits sometimes motivate their giving. 8. Confidence in nonprofit organizations’ ability to address social and global issues remains strong.HNW donors report having the most confidence in nonprofit organizations (86 percent) to solve societal or global problems. By comparison, confidence in the federal government and the public sector has declined since 2015. Results of this study are based on a survey of 1,646 U.S. households with a net worth of $1 million or more (excluding the value of their primary home) and/or an annual household income of $200,000 or more. To view a detailed summary of key findings and to access the full report, visit www.ustrust.com/philanthropy. SOURCE: US Trust, Bank of America Private Wealth Management and Indiana University Lilly Family School of Philanthropy Press Release.